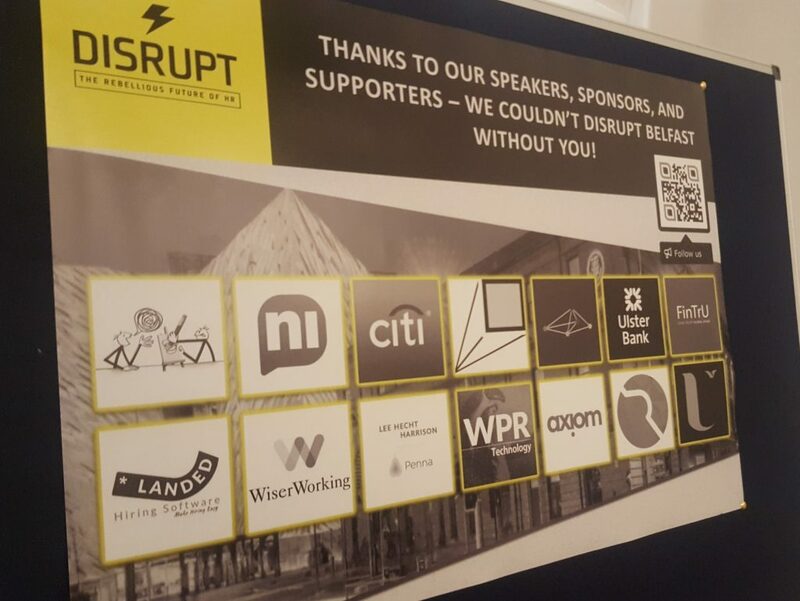 On Monday 1st April the worldwide network DisruptHR “LANDED” in Belfast. An exciting networking & shared learning opportunity for HR Professionals with a rebellious streak to gather together share innovative ideas and inspire each other to be the best in the industry. LANDED had the pleasure of sponsoring this inaugural event and what a tremendous energetic evening it turned out to be. 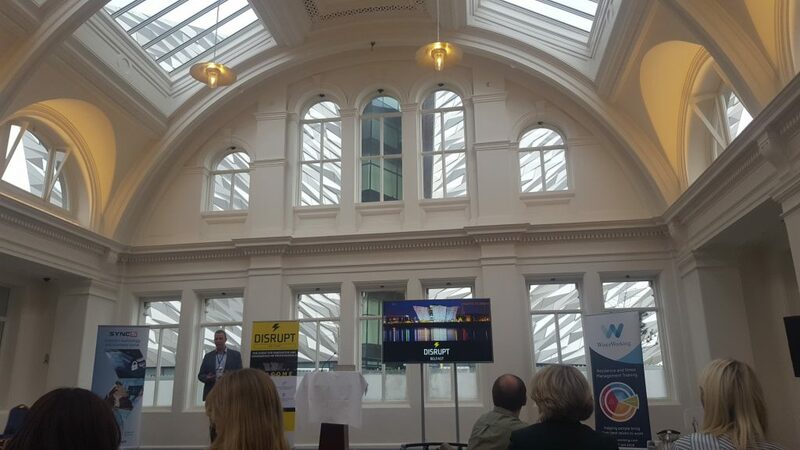 Ten inspirational speakers from a broad spectrum of companies and organisations shared their knowledge with a packed room overlooking the majestic Titanic Building in the heart of Belfast. There were many “take-away” points from the evening, and I certainly left with a renewed sense that what we are striving to do with our solution combining “recruitment marketing” & applicant tracking is right on the mark and in demand. I have to say all the speakers did a fantastic job, especially delivering a 5-minute petcha kutcha presentation, condensing a subject into 5 minutes & 20 quick fire slides, no easy task as I know from previous experience. Three speakers stood out for me, covering topics close to my heart, Employer Branding; Robots & AI and Developing female leaders. Sinead Carville, Executive Director @FinTrU highlighted the importance of building a strong employer brand to attract the best talent, emphasising the need to work together with your marketing team in collaboration & partnership and not just asking them for logos and pictures to pin on job adverts. Sinead described building an employer brand as “storytelling” how you need to adapt the content of that story to fit the delivery channel. This doesn’t mean changing the story; it could simply mean changing the language used or imagery displayed to fit with the advertising channel, just as consumer products adapt their marketing message to fit their various advertising channels to sell the same product to different buyers. Sinead was also very clear to point out that when building an employer brand, it is vitally important to remain authentic and genuine; otherwise, you’ll end up doing your brand more damage than good. At LANDED we have been telling our clients this for years. Employer branding goes beyond your careers page. Employer branding is the very essence of who your business is and how you are perceived. It was refreshing to hear from a HR leader such as Sinead about the importance of working closely with her marketing department, but also great to hear that her HR team has learned & developed new marketing-related skills as part of the employer branding journey. 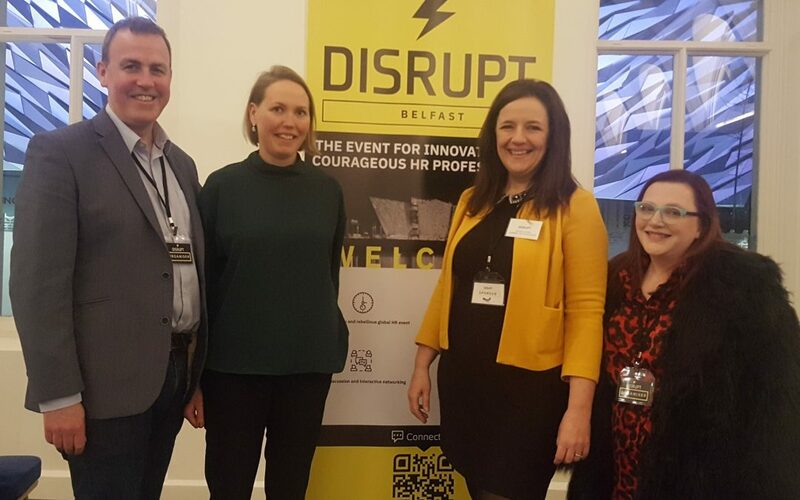 So many ‘Disruptive’ topics covered in one short evening: Measuring leadership; Virtual reality in HR; Managing agency relationships; HR budget wasters; Brand building; Developing female leaders & What a young careerist wants from the workplace. Glenda Nelson from LHH Penna faced her fears and did it anyway when she stood up to give her 5-minute presentation “She means business” – What works when developing female leaders? A refreshing, honest talk on the challenge’s women face in breaking the glass ceiling in the workplace and unblocking the talent pipeline. A realisation that we as women sometimes often hold ourselves back, interesting to learn that women tend to only apply for jobs where they match 90% of the criteria (or more), yet many men will apply for a job even if they only match 70% of the criteria, so we hold ourselves back and don’t put ourselves “out there” enough. While yes there need to be changes in mindsets in the workplace there also need to be changes in practicalities, with flexible working embraced to allow women to thrive within the workplace while still managing their other commitments such as the school run. The final stand out for me from the evening was Sandra Wright from RBS/Ulster Bank and her talk on “The Robots are coming… but are they after our jobs?”. As a founder of a business that incorporates automated candidate screening, I tend to get excited about any talk of tech in the HR process. We didn’t quite get to meet Archie, the newest HR officer in the RBS team, but we did hear about his amazing track record in reducing the time the rest of his team spend answering repetitive questions, freeing highly skilled and qualified HR professionals to deal with more meaningful challenges. ChatBots are still relatively new, and I am a firm believer they will evolve and have their rightful place in the workplace. 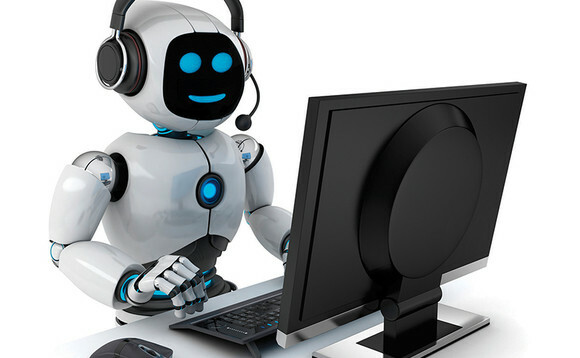 On the recruitment side of HR incorporating chatbots at the early stages of the attraction and selection post will reduce time to hire & if done right give the applicants a much better hiring experience. I am a firm believer in adopting and adapting technology to work for business; it should not be feared but embraced. As Sandra pointed out, introducing Archie to the HR function has not led to redundancies in the HR team, quite the opposite in that new roles had to be created to facilitate and develop this new service. So, are the robots after our jobs? I would have to say not just yet. HR teams need to be bold and be brave to adapt to the technological world we are living in, move on from “this is how we do it” mantras and look to find new ways to develop our businesses, our teams and our communities. Let’s not be scared to embrace new ideas, step forward and be disruptive, because a little disruption can lead us to greatness. 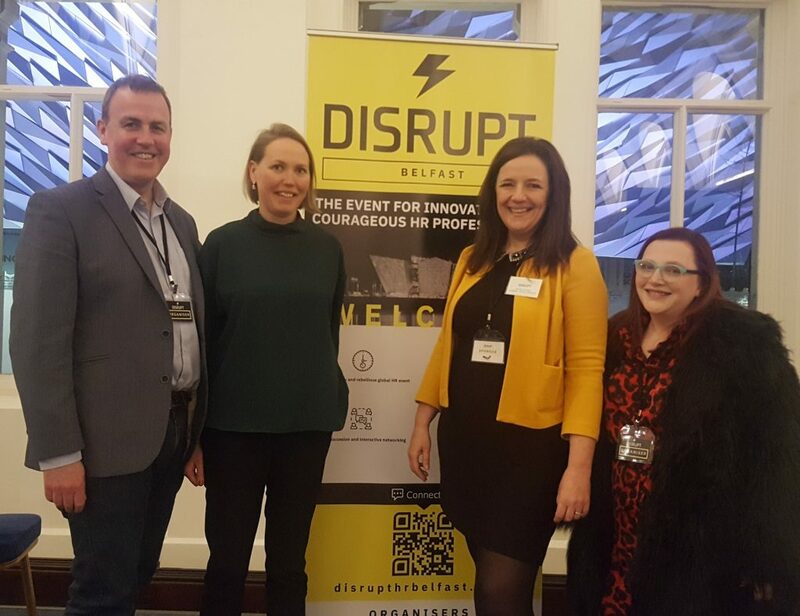 Thank you to Claire, Noel & Tina for inviting LANDED Hiring Software to sponsor this first of many DisruptHR events in Northern Ireland. If you’d like to find out how LANDED is disrupting the recruitment marketing & applicant tracking space reach out and request a demo to find out how we have helped our clients reduce time to hire by as much as 60%. Imagine what you could do with all that spare time!